The Gang Signs & Prayer Tour begins in March. Later this month Stormzy will release his debut album, Gang Signs & Prayer. This morning, February 7, the grime MC has announced a lengthy U.K. tour to coincide with the release. The Gang Signs & Prayer tour begins in Dublin, Ireland on March 29 before a host of U.K. dates culminating in two nights at London's O2 Academy Brixton in early May. 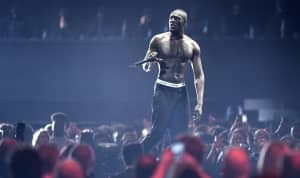 Check out the full dates above and revisit The FADER's interview with the director of Stormzy's "Big For Your Boots" now.